Here is a list of videos for games in development for Windows Phone 7 which I think can reasonably be available at the launch (which is currently supposed to be around this October). If you know of any more nice-looking games that you think will be available from day 1, leave it in the comments and I'll update the list. And do bookmark this, it will update! Thanks! Before game developers can get a publishing deal, sometimes a publisher will request a "vertical slice" of their game to show them what the game will be really like. It can tell them a lot of things, such as if the game is fun, what the minute-to-minute gameplay is like, what the "higher design" ideas are like (do you have continues, is there dialog branching, what is the main goal for a player, how long is a good chunk of gameplay, etc.) It can also show the publisher that the dev team can complete the designed game, and also how long it takes them to complete the work. Plus it's awesome, smarmy marketing-speak. It often feels unrealistic though, from the developer's perspective, to create a perfect slice of your game right up front--something already polished and fun. Sure the publisher is supposed to understand that Quality Will Improve, but I've heard many developer woes about publishers "not getting it". They can't see the vision that the developer does. One thing a vertical slice can do for the developer, though is hone their own work. I'm looking to show several publishers a portion (one might call it a vertical slice if one were feeling marketing-y) of Grapple Buggy to try to get funding and a 'deal'. 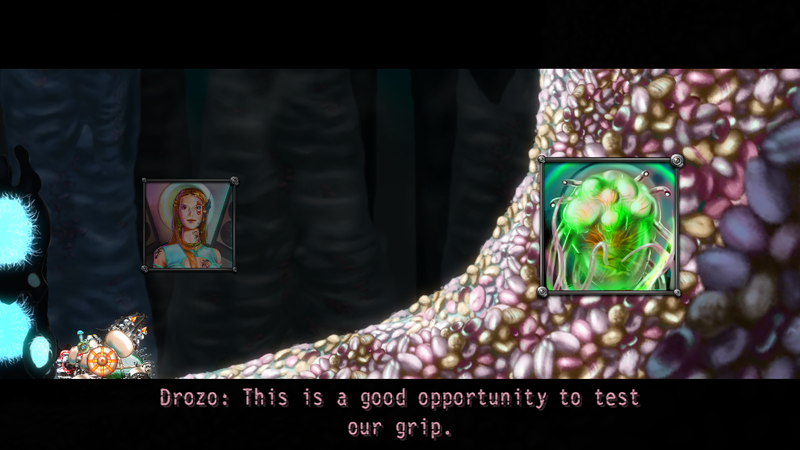 In the game, inside the buggy itself are your two main characters who deliver spoken dialog furthering the story and also giving the player hints. We recorded a good portion of the dialog about a year ago, and it took a while to process for the actual game. That was because of the amount of the dialog, but also because the methods used to process it and the design direction were all in flux. Everything's pretty nailed down at this point, and when we had to record a few new lines to make the flow smoother for the demo, it went really quickly. I knew what compression to use, resampling quality, the volume levels, and the post-processing effects that would make it all sound great. Figuring those things out earlier took forever and caused a lot of angst. But now, adding new content to my "vertical slice" went really fast and with total confidence. I love bashing publisher-marketing talk as much as the next dev, but in this case the concept can work out. Taking it beyond just a prototype, and polishing a portion of the game right up to near-finished can really show you how you want to do everything and how good the game will be. It can not only show the publisher you know how to do it, but you and your team as well.